If any of you haven't guessed already, then let me in on a little secret .. I adore painting my nails! I don't care what time of day it is, or what mood I am! Painting my nails releases my stress and having polish on my bare nails makes my day when I look at them and really like the view! 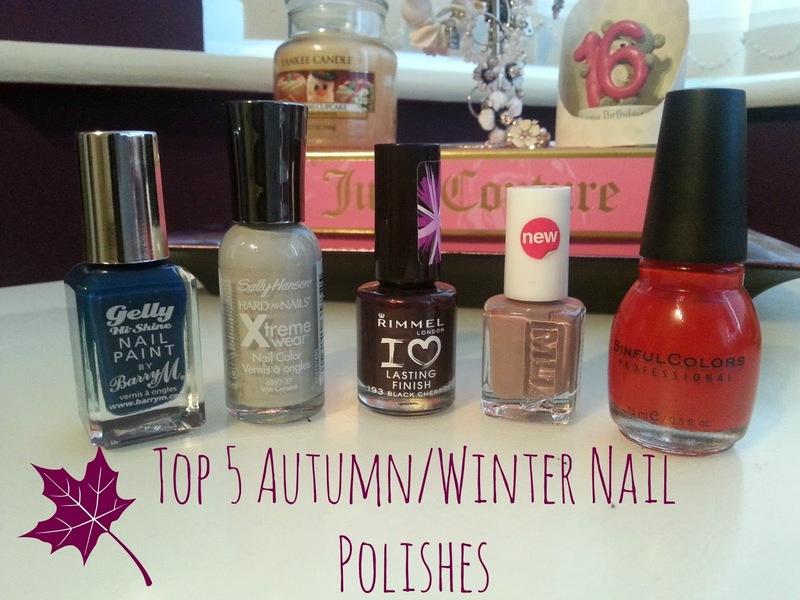 Today I bring you my fav's for autumn winter, the best time to get out all those deep colours and put away the bright pastels. I love these upcoming seasons and the transition from the summer months into the colder months couldn't make me more excited! Picking and narrowing it down to my top 5 was not easier! Just looking at the picture is making me want to paint my nails yet again! I also bought my self some nail wheels as they are so much easier to show you the nail colours on them my uneven, not manicured nails! Barry M Gelly in Blackberry - I go on and on and about these Gelly nail polishes and if you are fed up of me then just say so! But honestly you guys I am not even lying the formula of these are amazing and they are so glossy and last for a lifetime on your nails!This lovely deep blue colour is perfect for the autumn time! Sally Hansen Xtreme Wear in Wet Cement - This is one of those poundland buys and my oh my I am impressed! I freaking love Sally Hansen and everything that they do, but a polish is something I have never tried but now I will be trying out more. This grey colour is very unusual as I have never seen a colour quite like it, very cool toned and looks perfect on your nails. Rimmel Lasting Finish in Black Cherries - Currently wearing this on my toes, I have become to realise why exactly I bought it last year. For me personally, this is my one and only true berry love. At first glance in the bottle it seems a very deep purple, then when on your nails after two coats it is a dark purple/ black. The name sounds so wintry and the colour is just heavenly. MUA Moody Mink - Next up is a all time favourite from MUA - moody mink. I love their polishes, and this is why I fell in love with them in the first place..and moody mink (love the name as well it sounds so sweet and innocent). This is what I would call taupe and what a beautiful taupe it is. If you have never tried an MUA polish I would give it a go, for £1 you are getting a lovely nail polish that may not be great quality but is amazing. Sinful Colours in Go Go Girl - I am loving Sinful Colours at the moment, and for only £1.99 they are amazing quality! Go Go Girl doesn't just have a cute name it is an amazing colour, it did take 3 thin coats to build it up, but after it did I fell in love with it. Christmas time is the best time for red polishes and this is my favourite colour ever. that's what i was thinking, I think they need a little bit of renaming in their collection!